This is the official website for Magee Hillwalking Club. Originally founded by students of the University of Ulster, Magee Campus, Derry-Londonderry in the mid-1980s, the Club is now independent and includes students, graduates, alumni and local people. 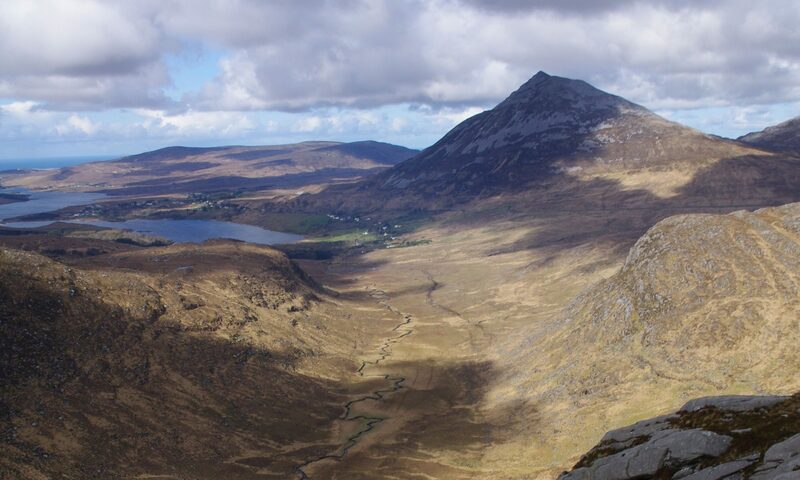 The Club organises walks in the North West of Ireland most Sundays throughout the year including hill, mountain and coastal walks. Walk are graded from easy to hard and a New Members Walk is held on the first Sunday of each month.To view descriptions of previous walks or to see photos choose a section from the menu above. We go out walking most Sundays throughout the year. Walks are usually in Co. Donegal, Co. Derry and the North Antrim Coast. To join the Club and receive walk alerts please register as a new member. Walk alerts are send out mid-week for the following Sunday. As walks are limited 15 people per walk let us know asap if you wish to come along! New members should join a New Members Walk as their first outing with the Club which are held on the first Sunday of each month. Please note new members will not be accepted otherwise. Please also let the Walk Facilitator know if you have any medical conditions that we should be aware of. There is a small Club funds contribution of £1 or 1.20 Euro per person which is used for the first aid kit, maps, etc. We also car share, so please let us know if you have a car and are willing to carry passengers. A petrol contribution of £4 or 4.80 Euro per passenger is given to your driver if you need a lift. Car seats are allocated on a first come basis and are dependent on the number of cars available on the day. Gear requirements are sturdy walking boots, waterproof coat and trousers, hat, gloves (bring spares of both), food and drink, an extra jumper/fleece and a change of clothing, socks etc (to be left in car). And a ruc sack to carry it all in. No jeans, please! We leave from the main car park, off Rock Road, Magee Campus, at 10am most Sundays with car pooling/meeting points in Buncrana. Other meeting points are possible depending on the walk location. Contact the Walk Facilitator – [email protected] – for further details. Hope to see you out soon!